Things like fire etc. I loop in post-production, turns out to be the easiest way and fastest. 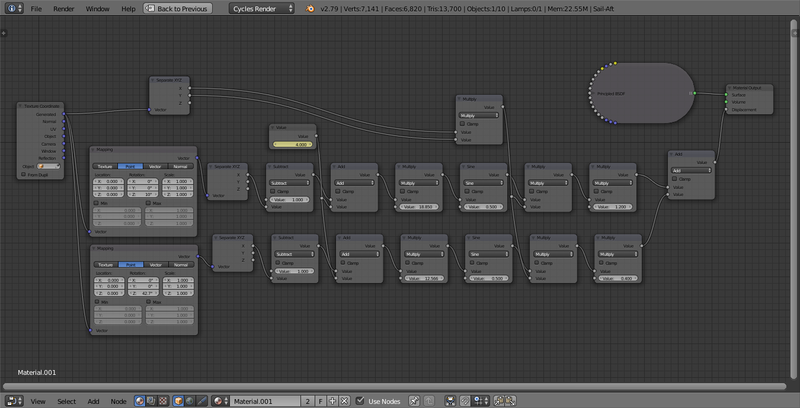 Just render a bigger chunk of the animation, split it in half and switch the halves. The ends are now seamless but in middle is a discontinuity. Overlap those two parts and blend them with opacity and by pixel-warping if needed (visible edges should be pixel-warped). Picking the right moment for blending is crucial. Reversing frames and having a ping-pong animation will not work on flags, fire, etc. - That's why it needs to be blended. This uses a similar technique as that described in Create Seamlessly Looping Animated Displacements and Creating looping cloth animation for sprite to generate the cyclic motion rather than using a cloth simulation. This allows you to determine the actual frequency of the motion to ensure that it exactly matches at the start/end of the loop. The idea is to generate the displacement using a set of interfering sine waves. By carefully selecting the frequency of the waves they can be made to finish at the same point in their cycle at the end of the animation. Multiple waves are combined - with each oriented in a different direction and possible a different frequency - to produce complexity to the waves. Note that the Sine function repeats every 2*pi radians so any frequency multiplier needs to be kept to a multiple of 2*pi. The same method was used for the sails and the flag, as well as the ocean. The motion of the hull of the boat was also carefully tuned to match the length of the animation by way of an F-curve modifier with the Phase set to cycle based on the number of frames. This consists of two lines of almost identical nodes - effectively two sine waves with slightly different properties - based on the X coordinate. The Mapping nodes allow each to be offset to produce waves with different directions and the Multiply nodes allow the frequency and amplitude to be adjusted. Ensure the Frequency multiplier (that before the Sine function) is always a multiple of 2*pi to ensure the end fram timing matches the start. The Value node controls the progression through the frames and should vary between 0 (at the start of the animation) and a multiple of 1.0 (at the end of the animation). Note the Separate XYZ and Multiply nodes at the top - these create a factor that varies the amplitude of the waves across the sail - so that the 'leading' edge of the sale has less motion than the 'trailing' edge (eg, where it's attached to the mast). A similar material is used for the flag and the sea. Just a thought: try baking your simulation to frames, assign those frames to an action and then in the Non-linear editor, insert the action twice, reverse one of them and position it so that it slightly overlaps the end of the other-ones time segment. The NLE will average the the key frames in the overlap and the ends should be seamless. It's sort of the same trick Jerryno described but using the NLE instead of post production. Not the answer you're looking for? Browse other questions tagged animation physics cloth-simulation force-fields or ask your own question. How can I create a smooth looping animation for cloth simulation? How to make looping/cyclic clock-hand animation seamless? Is running cloth physics without animation, or an endless non-looping animation possible?